The vineyard consists of 55 hectares (135 acres), on 38 different parcels, which provide with a rich, wide range of soils and climates. The soil is a mix of clay, chalk and sand with pebble stones. The improvements at the Domaine have been incredible: new pneumatic presses, new stainless steel vats, new destemmer, new vinification and aging plant, and aging in oak barrels for the top wines. All the grapes are raised by culture raisonnée which is very close to organic viticulture (intervention in the vineyard only when necessary). The yield is reduced in the vineyard by ébourgeonnage (de budding in spring) and vendanges vertes in summer (green harvesting). Oak aging for the top wines in special barrels like "jupille" for 10 months. 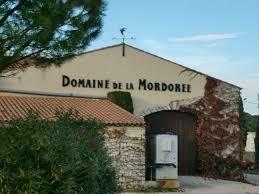 No expense is spared at this Domaine to achieve quality. Wine Advocate 89"Bursting with cherry-scented fruit, the 2016 Cotes du Rhone La Dame Rousse is a worthy value. Deeply concentrated and richly textured for a Côtes du Rhône, it should drink well for 5-8 years." Wine Spectator 90 "Ripe and pure, offering a delicious core of plum sauce, crushed currant and boysenberry fruit, laced with lavender, anise and violet notes. The long, juicy finish has a graphite edge. Drink now through 2012. 3,000 cases made." " 50% Grenache, 50% Syrah. Hand harvest.